This no-recipe recipe seems like a quick way to approximate the divine roasted chicken and bread salad from Zuni Cafe, which I often dream about. Scatter a bunch of sliced onions and shallots across the oiled bottom of a large pan, then put a bunch of chicken thighs on top, skin-side up. Season the thighs with salt and pepper, then slide the pan into a 425-degree oven to roast until the chicken is crisp on top and cooked through, about 35 minutes. Shake the pan every so often, and add wine or stock if the onions are browning too fast. (optional) Meanwhile, make some croutons from good, chewy olive-oil-tossed bread, toasting them until golden in a pan or in the oven alongside the chicken. They can be cut or torn up — no matter. 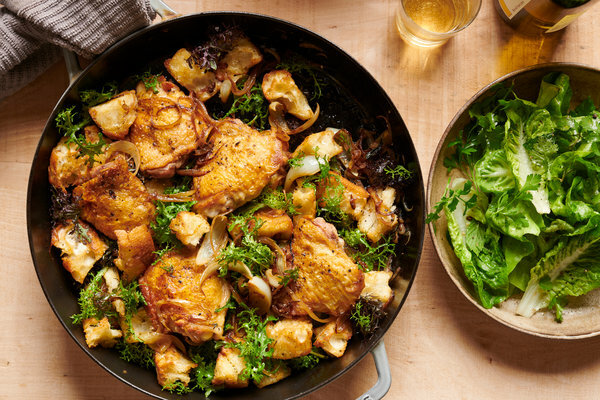 Put the croutons on a warm platter, dump the contents of the roasting pan over the top and arrange the chicken on top of that, mixed with bitter greens.